Discussion in 'Need for Speed!' started by Turdle, August 13, 2007. I called a machine shop about a mile from my house today and they said they can balance the rotating assembly using a 50 oz balancer. The machinist I talked to said he prefers to take it off the balancer if possible. The lady that handles the pricing was out of the office but he said $300 to play safe. He didn't think it would be that much but he didn't want to say it cost x amount & then be more. I lost something in translation here.. Is the 50 oz balancer for a stroked motor or a 302? I forgot about all the tuning issues as well. The tuning on a commbo like this will be pretty straightforward. Nothing much to tuning a N/A vehicle, even if they are cammed and stroked. Spas forget that Focus SVT pump. You have a return fuel system and will need a return type of fuel pump. Even if you had a returnless I would recommend against the Focus pump. Just go with a Walbro GSS342 255lph fuel pump. It will support all your N/A needs. Also electric cutouts are DAMN expensive so they could be something reserved for later on in the project instead of right away. Just a few thoughts. You have to use the stock balancer (which is 50 oz) because the Explorers use D.I.S. and the crank sensor is part of the harmonic balancer. All of the after market cranks are 28.2 oz balance be it 302 or 347. Here's my custom 28oz. balancer, about $330 from Total Performance. It takes the 94/95 SN95 Mustang crank pulley. Color me crazy, but theoretically could I take off the Mustang balancer, weigh it, and have the Explorer one cut down/shaved/whatever-it-is-they-do to match the weight of the old pulley? Wouldn't that work? The difference in weight between the balancers is nothing for the balance process, the machinist can use either one. You can't bolt either in place of the other on an existing engine, both because of the pulley location and the weight. Still, for a machinist who is balancing the assembly, provide them with the required balancer for the front dress and PCM. For the Explorer you must use the Explorer balancer. 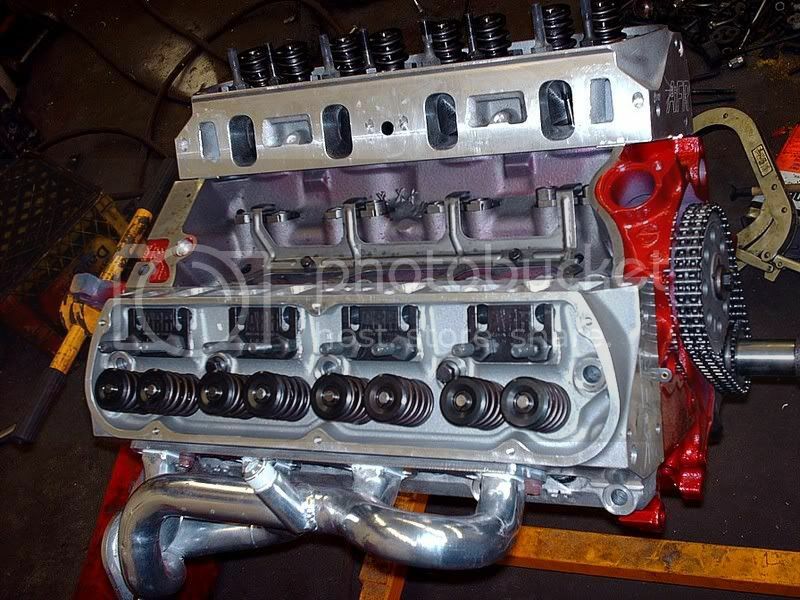 For a Mustang EECIV engine you must use that type of balancer, which there are dozens to choose from. Spas, are you trying to bolt on an Explorer balancer to an existing engine in vehicle? I want to convert my Lincoln 302(Mustang HO) into an Explorer PCM system. I shall swap engines to convert it all, the front dress with AC pump etc. It is a lot to do, but it's the right way to get the OBDII PCM into the vehicle. now is the time to be sure it is correct. They will need to spin your rotating assembly with the explorer balancer attached--there is no work around for this. Thats the same thing I had done. Lotsa holes in the front counterwight of the crank, but it balances! 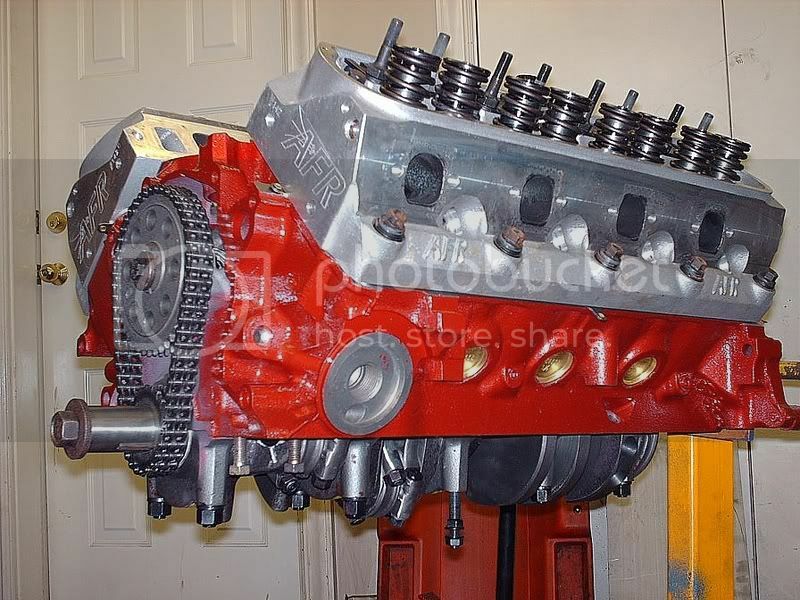 That is how an engine is balanced, the crank is drilled and filled. yea ...but... the guy that balanced it wasnt too impressed drilling all those holes on a 28oz balanced crank using a 50oz balancer, there is drilling involved or adding metal but taking out about half a pound is quite a bit since the missmatch is so great. nice. are those 165s or 185s? what kind of headers are those? AFR 185s with Ford Motorsport stainless headers that were ceramic coated ( yes some bolts are missing since I was just mocking it all up). I have no idea what numbers they put down to TMs, Im curious also on a comparison on the same engine. Im just happy they wont sputter like the cracked 97s I had . "That is purdy," I'll think about the dark red for mine also, maybe black heads and oil pan, or powder coated pan(aluminum Jon). Jon, have you had any feedback or heard whether clear powder coat will survive around an engine(for bare aluminum)?